An increased intake of vitamin C can be vital to a successful pregnancy, because this vitamin offers many positive health effects. 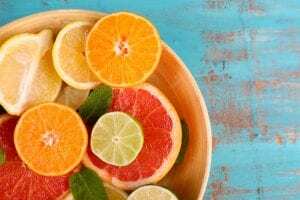 Scientifically known as ascorbic acid, vitamin C plays an integral role in numerous bodily functions, in addition to the health of organs like the blood, heart, brain and structures like muscles and bones. Deficiencies of this chemical could precipitate the onset of several illnesses. As a baby grows in utero, extra weight is placed upon the mother’s body. Avoiding pain and physical injuries that might occur as a result will require strengthened bodily structures. Vitamin C plays an integral part in maintaining muscle strength by aiding systemic production of a substance called collagen. Collagen is a protein that builds and strengthens cartilage, ligaments and tendons, which are soft tissue structures that connect muscles and bones. Increased physical strength can keep a soon-to-be mother mobile and physically healthy. When pregnant women consume food, they are absorbing nutrients for both herself and her unborn child. Such circumstances place additional dietary requirements on the expecting individual, as vitamins and nutrients are absorbed at a quicker pace. If the mother doesn’t intake enough healthy food, both woman and baby might be susceptible to nutritional deficiencies. Vitamin C possesses the ability to help the body draw in and metabolize crucial elements, such as iron, more efficiently. Invasion by infectious organisms like bacteria and viruses, as well as other potential toxins and pollutants could precipitate potentially serious illnesses in pregnant women and their unborn children. Classified an antioxidant, vitamin C is valuable in the fight against such invaders. Antioxidants possess anti-inflammatory properties. The buildup of systemic inflammation often precedes the development of many nuisances like minor physical injuries but can also be the impetus for the formation of major, potentially serious ailments like cancer, diabetes and immune system disorders. Antioxidants reduce or eliminate bodily accumulation of inflammation. Additionally, antioxidants curtail or, in some cases, obliterate the systemic infiltration of harmful substances medically known as free radicals. These environmental and airborne toxins enter the body and precipitate a process called oxidative stress in which cells, tissues and organs become inflamed and damaged. The increased intake of foods and beverages containing high concentrations of antioxidants limits or reverses the impact of oxidative stress. Vitamin C is not naturally produced by the human body. Therefore, individuals, particularly those who are pregnant, must ingest foods with significant quantities to maintain optimal health. Expecting mothers can increase their intake of vitamin C by consuming specific foods and drinks. The nutrient is most often found in produce items. However, high concentrations of the substance is also found in other foods. Vegetables– Exceedingly high amounts of the nutrient are contained in peppers (red, yellow or green), Brussels sprouts, spinach, kale, snow peas, broccoli and cauliflower. Fruits – The highest concentrations of vitamin C are contained in citrus fruits, such as oranges and grapefruits. Other fruits containing high concentrations of vitamin C include cherries, guavas, strawberries, kiwis, apples and black currants. Juices – Beverages like apple, orange and grapefruit juices contain large amounts of vitamin C.
Grain Products – Bran cereals are also rife with healthy concentrations of vitamin C.